The group was created in 1998 with three members: Andreas Lundstedt, Tess Merkel (born Therese Merkel, 18 April 1970, Nykoping, Sweden), and Annikafiore Kjaergaard (born 18 May 1971, Bjarnum, Sweden). Their first single, „Shine On“, was successful in Sweden but it was with their second release, „Crying At The Discoteque“, that they achieved success across Europe. Both singles appeared on their debut album Casino. Later editions of Casino contained a cover of the Human League’s hit „Don’t You Want Me“, which also served as the album’s third single. In the United States, Alcazar gained moderate success. „Crying At The Discoteque“ peaked at #44 on the Hot Dance Music/Club Play and „Don’t You Want Me“ peaked at #30. In Autumn 2004 Alcazar released „This Is The World We Live In“. The track samples Diana Ross’s 1980 number one „Upside Down“ and uses lyrics from Genesis‘ 1986 single „Land Of Confusion“. Their follow-up single was entitled „Physical“. They released the album Dancefloor Deluxe in Sweden in August 2004. In the winter of 2004 they released the Christmas single „Here I Am“. 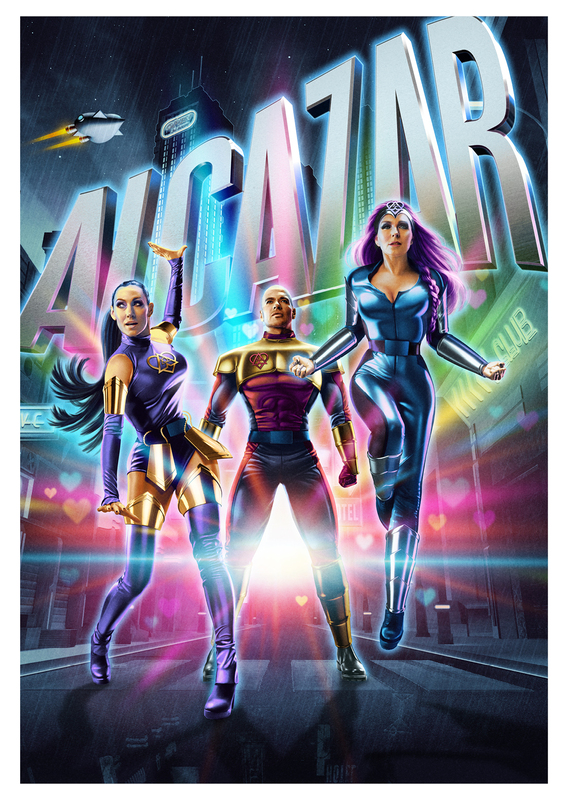 Alcazar enjoyed considerable success in 2004 in their home country Sweden. This Is The World We Live In, Physical, Dancefloor Deluxe and Here I Am all achieved solid sales. 2005 saw the release of their single „Start The Fire“. In May 2007 the band did a one – off performance in London at legendary night club „G-A-Y“ and invited friend Lina Hedlund to join them on stage. It all turned out to be a very successful combination and a few months later , the „New Alcazar“ was formed. In January 2008 their first single „We Keep On Rockin´“ was released. Music and lyrics by long time team member Anders Hansson. „We kepp on Rockin´“ quickly turned in to a smash and only a week after release the single passed gold status in sales. The band is currently back in the studio in surch for the ultimate follow – up. They are constantly on Tour and are looking forward for every show.